1988 Ford F250 possible vacuum leak? 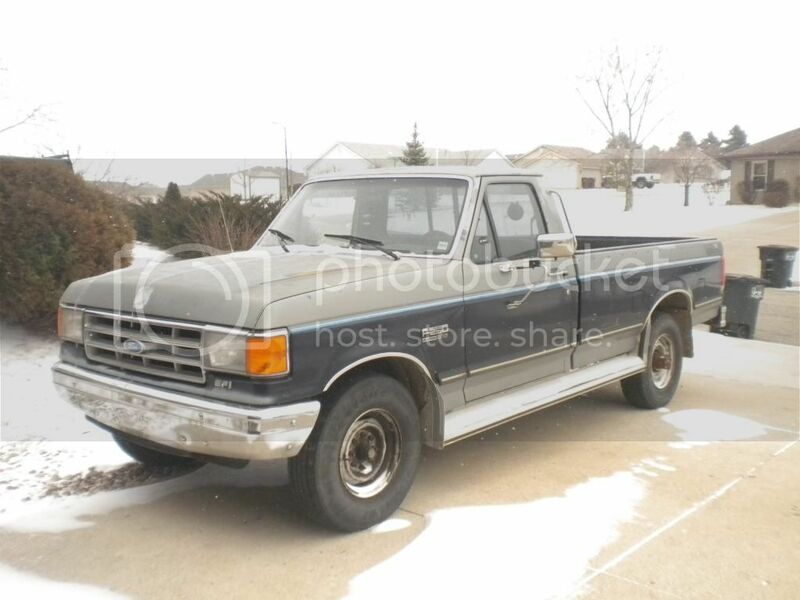 I just bought a 1988 F250 2 wheel drive a couple days ago with a 5.8L. 136,000 miles on it. The guy I got it from said he thinks it has a vacuum leak. He replaced all the vacuum lines he could reach on top of the engine. He tried a couple other things but I can't remember the names of the parts i believe a computer unit and another small part he showed me. The one part looks similar to a car radio amp (sorry don't know how else to put it) and on the back it says E8TF-AU1B in small numbers then 8TN in larger numbers. It's a box about 8 inches by about 5.5 inches. And has a place in front where something plugged into it. The other part is about 4.5 inchs long and a couple inches wide has a plug in in front and 3 prongs on one side. It says Motorcraft E3EF-12A297-A1A. So he said not to replace those as he already did. but he couldn't still find the problem. What the truck is doing is at low RPMs it wants to stall and sometime quit while idling.Once driving down the road it has its power but every so often at highway speeds as i let off the accelerator a bit you can feel it kind of stall a little until you get back into the gas. Once you give it gas it seems alright for the most part but still acts up a little. He put new plug wires on it. i don't know why he didn't replace the plugs and distributor cap and rotor but i will be putting those on soon. Would bad plugs, cap, rotor maybe cause this? No clue how old they are or does this sound like a vacuum leak or maybe something else? Any advice or direction on what to check for is greatly appreciated. I forgot to add, when the truck is just idling, the rpms will dive down like it;s going to quit then go back up to normal. It will do this the entire time it's running then sometimes as the rpms dip it just dies. But starts right back up only to keep doing the same. The first thing you need to stop doing is throwing parts at it because you will go broke without solving the problem. Is this basically just an unstable idle problem and runs good at all other RPMs? Have the computer scanned for stored trouble codes and post the numbers here. I just bought the truck so I haven't bought anything for it other than the aformentioned tune up stuff I mentioned and i was going to do that anyway. But that's why I came here. I don't want to throw any parts at it until I can maybe figure it out. When the engine is cold it does cut out at other rpms as well but once it warms up it runs pretty decent but still does cut out similar to the engine "missing" but not real bad. Can you advise me where to get the codes and how much that would cost? thanks. Do you have access to an analog (needle) type voltmeter or a digital lab scope? I do have a volt meter. I don't know what a lab scope is though. I asked about a specific type of meter, one with a needle, not digital. You can probably still get a code reader (have one for these) but it's mostly getting the book with what the #s mean. It's a cheap thing that just plugs in underhood to connector and blinks there and you count them for the #. Frankly I never found them very helpful unfortunately and now at the age you should be looking for a breach in vacuum no matter what has already been done. Lots of plastic vacuum line that breaks like raw speghetti if touched by now that goes into rubber plug connectors here and there. Been a while and I own two now! This stuff lasts near forever if oil is always changed and some good fuel solvent specifically Chevron's Techron used in fuel with some regularity - suks to add to cost of fuel but you don't need to use it all the time just some now and then. No joke - forget most other brands. You'll make me go read my book on how to count the blinks which should repeat. By rights it should show if an IAC is a problem area - meaning area not absolutely that it is bad! The plug as shown above as an irregular trapezoid should be just hanging underhood if anything like the cars of that era. If you unplug that IAC motor if you will it should just about stall or really stall. Part new is now under $70 if you want to waste more $$ and not test things out more. Not that common to need these but all these were newer before they hopelessly rusted out too rendering the vehicles unfix able just for that. Again - more common to break those plastic vacuum lines even just checking automatic trans fluid level or changing plugs! If you find one broken you can splice in vacuum hose that fits tight over broken area. OK Tom you can finish this. Thanks guys. I'll check those things out and see what happens. Fingers crossed and again, thank you both for your advice. That distributor cap is right in the front of the motor and needs no tools to pop it off. Have you looked inside it to see the condition of the terminals? I haven't done anything yet. The truck is too long to fit into my garage so I can't close the garage door. And's it been cold and very windy and snowing so I'm waiting out the weather for a couple more days. haha. Weather should be better in a couple days. When I was younger i didn't let the weather bother me but now days I'm a wuss. Haha. I agree they rust out really bad. I was lucky this is a truck from the south. It is only showing slight hints of rust bubbling though on the rear wheel wells and i'll be taking care of that soon and it's straight not dented. Paint is weathered and faded a bit but thats about it. Interior is nice. I paid $800 for it and I hope the engine stuff will be an inexpensive fix. I think I did ok on it. I'd post a pic of it but I don't know if this site allows that or not. You can post pics but not directly uploading. Go to a video hosting site like photobucket and then paste the link onto your next post. I haven't seen one that clean around here in 15 years. HaHa. that's a little bit of snow. Haven't had much of a winter as far as snow goes this year.